The idea behind the following sample code is this: There should be four plots, and for each plot two parameters should be set. This is achieved through \def just before \nextgroupplot. Apparently, this approach is not sound. Here's the output of the above snippet: . Neither works. 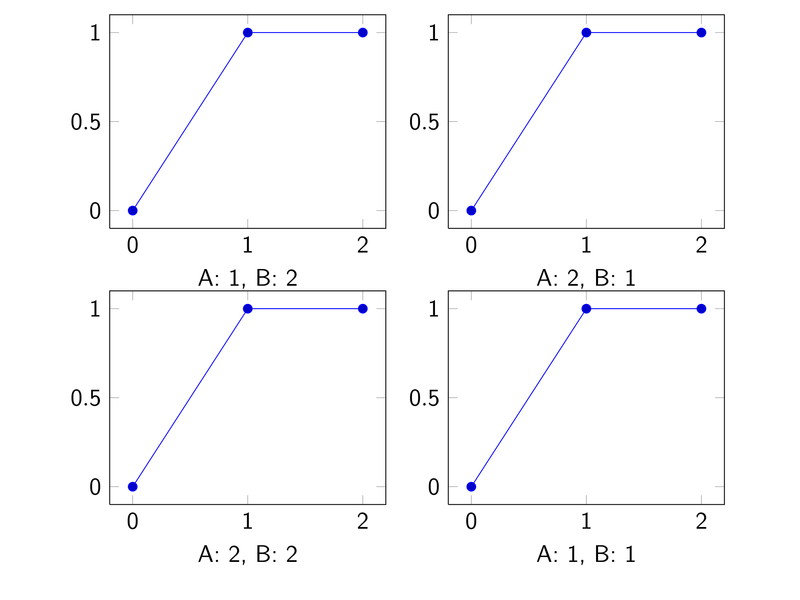 All four plots appear to take their parameters from the very first definition only. For the labels, the order is changed (2-3-4-1 rather than 1-2-3-4). Q: Why is that? What's the proper way to do what I mean to do? The pgfplots package doesn’t execute everything right away but does collect the plots first, calculated stuff and then actually draws something. With the etoolbox package you can use your two loops (at least in this example) pretty easily to build a macro that contains all Plots with expanded values \myA and \myB.